I'm calling it now: I don't see Carrot joining before Wano if Jinbe isn't around. The momentum I was envisioning with both Sanji and Jinbe on board is gone. I don't even know if we'll get confirmation of Pedro's fate before we go. It's probably Wano where the core crew will be finalized, and that's gonna go on through 2020. I certainly still think Carrot has a chance, as long as she opens up a bit more and we see more about who she is. With her spot alongside the crew on the latest cover and Pedro's fate still up in the air, there's a lot pointing to her ongoing importance. But without Jinbe's "The Tenth" chapter, there's no way she can get her "The Eleventh" now. Once the Sunny reaches Wano, I'll pay up. In the meantime, I've got my new avatar on standby. I told you man, she needs to learn what "the dawn" is before she can join the crew. I don't doubt the extra time will be beneficial for making that motivation clear and personal to her. But I still think if Jinbe had stuck around, it would be really weird for her not to be invited too, after everything she's done for the crew and Pedro being cleared as the third wheel, so to speak. But I chose the place for my last stand, and I've got no regrets. I trust you and the others will keep up the fight just fine. Yeah. She'd need to talk to Inu and Neko (and maybe Wanda) first, anyway. They'd give her their blessing and then she'd be all set. We already got something like that from Wanda, acknowledging that Carrot's gonna do what she wants and that she's at least with a strong group. If we get a more touching farewell in Wano, that's great, but it would have been fine either way. Considering the wild storyline Oda is producing recently,i am ready to bet that we are yet to see the 11th person. I'm not sure I follow. How does a wild storyline prevent Carrot from joining? Or are you saying that Carrot is clearly being set up as the next crewmate, and the story is so wild that her not joining would be a curveball? Last edited by AvocadoInTheRain; April 16th, 2018 at 09:15 AM. Nobody has ever said that. Tsukyo-like character from gintama? Too robin-like. Otose-like character for strawhat, we still need the grandma. I'd say Suzuran, but she was just an old lady on her deathbed, even though she was the past geisha and all that. It seems that Auem was saying that. That she was being set up to join, but it might actually all be a ruse by Oda. Did not think that Jinbe would join for a while, just the nature of rumour and reputation in the OP world it would be hard for Luffy to shine if he was considered only an ally of the ex-Shichibukai. To me the only point Jinbe would be able to join the Straw Hats was when it was going to be very, very clear that he was joining Luffy as an underling. Doesn't mean I'm not disappointed as hell over this and wish that we'd reached that point already. Carrot looked as if she was well on her way into joining the crew until she got her super-saiyan bunny powers. It took her from competent to on the verge of completely over-powered. Even if it is only once a OP month it made me feel she was far less likely to join. Don't know if she's going to travel with them past the arc, but it doesn't look like we'll see the new members until deep into Wano. We'll get a technical grandma on the crew but she'll have nami's current face and body shape. Since the Straw Hats are now officially departing from Totland, and Zeus is still in Nami's possession, would that technically make him a crewmember if she gets to keep him? I mean, by the same logic Usopp's Kabuto plant is also a member, but Zeus has a face and does stuff. Pretty likely that he will hang around, getting more and more attached to Nami, while also being her New World powerup. But, like, how long is he going to last? If Big Mom is defeated, won't he go away, too? If Zeus is a crewmate, then so is their den den mushi. 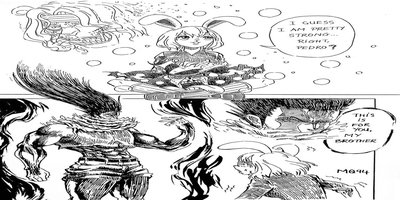 Carrot looked as if she was well on her way into joining the crew until she got her super-saiyan bunny powers. It took her from competent to on the verge of completely over-powered. She's ridiculously fast in sulong mode, but she probably isn't much stronger than Sanji. The only problem with zeus is that him and prometheus are bros, just like zoro and sanji, cavendish and Bartolomeo, luffy and usopp. So if zeus joins, prometheus joins too. Maybe because of his cake, bm gifts sanji prometheus. And yes, zeus is not actual nakama, he is like a living weapon, nami's pet and weapon at the same time, similar to Lassoo(mr 4). Last edited by uniaka ikuzakas; April 18th, 2018 at 01:27 AM. If Carue counts as a crewmember, so does Zeus. Carue is more sentient than Zeus, but then Zeus is a lot more sentient than a den den mushi or the black kabuto. Zeus isn't there willingly though. He's a prisoner. So however sentient he may be, he doesn't rise above the crew status of Caesar Clown.